Kerang is a rural township on the east side of the Loddon River, 250 km north-west of Melbourne. It is near the intersection of the Loddon Valley and Murray Valley Highways, and is on a railway line from Bendigo which enters New South Wales beyond Kerang. The first white settlement in the Kerang area was the Loddon/Pine Hills pastoral run (1845). When it was acquired by Archibald Campbell in 1855 it is thought that Campbell named the rise on which Kerang is situated Mount Kerang. The word is derived from an Aboriginal word, variously recorded as meaning moon or an edible root vegetable. Actual settlement at Kerang began with the Loddon Inn (1848) and a nearby store the year after. South Australian travellers to the Victorian goldfields came by boat to Swan Hill and overland via Kerang. The township was gazetted in 1861, the year before a road district was proclaimed, extending from the South Australian border to Cohuna. (The district’s area was 10,490 sq miles and it had 43 ratepayers). When the road district became Swan Hill shire in 1871, Kerang was made the administrative centre and continued in that role as new shires were created by severance. By the mid-1870s Kerang had a post office (1862), a police station and court house, a Government lands office (1874), a shire hall (1873), Anglican and Methodist churches, a school (1873), hotels, stores and the Kerang Times and Swan Hill Gazette (1876). There had also been an experimental farm irrigation project (1863), by water pumped from a river, probably the first such project in Victoria. A mechanics’ institute was opened in 1880 and the railway was extended from Pyramid Hill to Kerang in 1884. A further extension to Swan Hill occurred in 1890, and a tramway was built from Kerang to Koondrook in 1889. 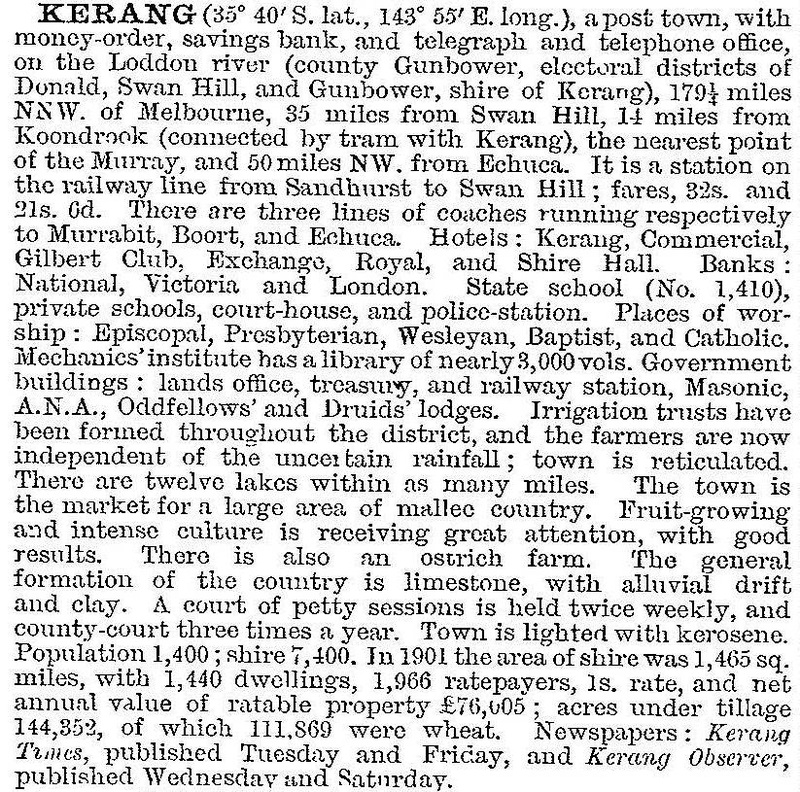 Between 1900 and 1920 Kerang’s population nearly doubled to over 2000 people. A high school was opened in 1919. There was a Kerang shire (1898) from which Cohuna shire was severed in 1922. The Torrumbarry Lock-Weir was completed in 1924, and the Torrumbarry Irrigation District included Kerang. Population growth continued steadily, peaking in the 1960s at over 4100. Additional amenities such as an enlarged bush nursing hospital, a water purification plant, a sporting complex, an Olympic pool and enlarged shopping facilities were built. The township was separated from the shire and proclaimed a borough on 1 April 1966. Several church buildings were enlarged and a Baptist aged persons’ home opened. Kerang has a wide range of recreational facilities. Within the town there are cycling and horse racing at Alexandra Park and the showgrounds, tennis and bowls at Atkinson Park (including a caravan park), a swimming pool and a golf course. There is also a Kerang District Football League. About 8 km north of Kerang there are Reedy, Middle and Third Lakes; Middle Lake is a renowned ibis rookery. The lakes are used for boating and fishing. In September 2010 and again in January 2011 many parts of regional Victoria experienced widespread severe flooding. In Kerang floodwaters isolated the town and the levee temporarily held back water from the Loddon River until it failed, inundating thousands of residents. The levee was later strengthened. Volunteers filled sandbags to protect the Horfield substation which powers parts of northern Victoria. A permanent levee replaced the temporary levee in 2014. Kerang has a high/technical school (1919), a TAFE, State (1874 and 1968) and Catholic (1912) primary schools, five churches, several hotels and two motels, an Agricultural Society, a saleyards, a substantial shopping centre, an historical museum (1969) and the office of the Gannawarra shire. In 2014 Kerang primary had 53 pupils, Kerang South primary 223 pupils and Kerang technical high school 354 pupils. In 2013 the Kerang Hotel was partially destroyed by fire. On 20 January 1995, Kerang borough was united with Cohuna shire and most of Kerang shire to form Gannawarra shire. The median age of Kerang’s residents was 46 at the 2011 census compared with 37 for Australia.